Boil up water, milk, butter, granulated sugar and sea-salt. Add wheat flour and toast the mixture. Put whole egg in the hot mass and mix it well. Pipe it on a baking tray. Put the crispy dough on the top. Bake it at 170°C for 35 minutes. Put all ingredients in a bowl and mix it to a smooth dough. Roll out between two chocolate sheets and cut it into pieces for the choux. Boil up puree, juice and dry ingredients. Cool it down and fill it in a piping bag. Mix dry ingredients and boil it up with water. Put in puree, juice and vanilla bean. Mix it well and freeze it in the ice cream machine. Mix it well and fill it in a piping bag. Boil up milk with vanilla bean. Put gelatin in hot milk and pour it over chocolate. Mix it well, cool it down to 35°C and fold whipped cream. Pipe it into moulds and freeze it. Melt chocolate and cocoa butter. Cool it down to 38°C and dip frozen chocolate mousse. Dip choux into the crystallized chocolate. Fill choux with ganache and sherbet. 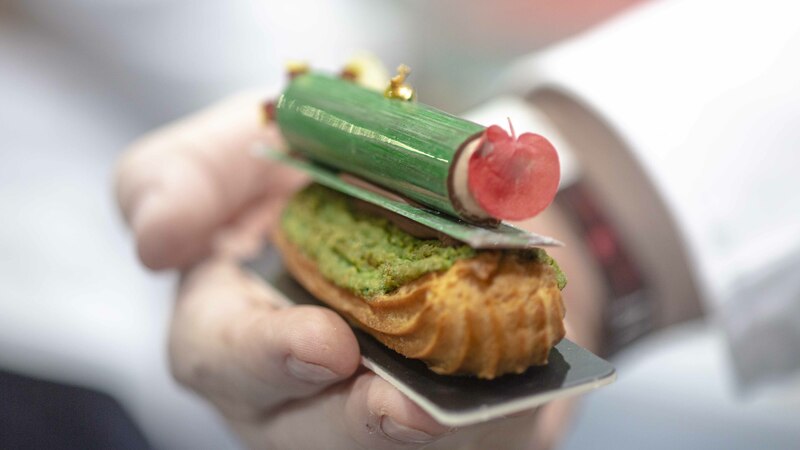 Stick the chocolate mousse rolls on the choux and decorate it with coulis, gold leaves and shiso cress .